Treating inflammation and itching caused by certain skin conditions. 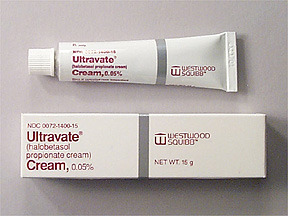 Ultravate Cream is a topical corticosteroid. It works by reducing skin inflammation (redness, swelling, itching, and irritation). Halobetasol is a topical (for the skin) steroid. It reduces the actions of chemicals in the body that cause inflammation, redness, and swelling. Halobetasol topical is used to treat the inflammation and itching caused by a number of skin conditions such as allergic reactions, eczema, and psoriasis. 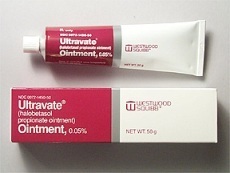 Ultravate is a topical corticosteroid given to treat the rash, itching, inflammation, and other forms of skin disorders including eczema and psoriasis. Drugs like Ultravate do not cure the cause of these problems but they can quickly relieve the symptoms by interfering with the production of various substances in the body that cause these skin disorders. That is why it is imperative that corticosteroids like Ultravate should not be used without prior consultation of your physician, as these conditions could be a symptom of a larger problem. Ultravate is a high-potency steroid medication that relieves the itching and inflammation caused by a wide variety of skin disorders. It is available in cream and ointment formulations.